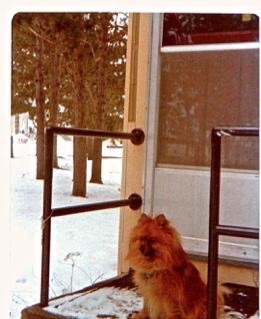 When I was a teenager I had a Pomeranian dog. I named him Benny, after Elton John’s song Benny and the Jets. I bought him as a puppy. He was red with a black nose. People told me that he looked like a little fox. He was adorable. Most thankfully, Benny was a good and happy dog. When I got married and moved to Nova Scotia, Benny came to live with me and my new husband. We live in a modest little bungalow on the edge of a forest just outside Canadian Forces Base, Camp Greenwood in Nova Scotia. A small public-school bordered on our backyard. There was a pathway alongside of my house on which the little children would walk to and from school every day. Benny was pretty good about the children and let them pass by undisturbed. However there was a young brother and sister which for whatever reason peaked Benny’s interest. I knew the exact moment that they were walking by the house on their way to school because it was the only time that Benny ever barked. I could never figure out why. One day I was in the front yard when the little brother walked by me on his way to school. He was not accompanied by his sister. I found it interesting that Benny did not begin barking as he approached. The little boy stopped and began talking to me. “What’s your dogs name?” he asked me. “Where’s your sister?” I asked the little chap. “I like your dog,” the youngster said to me. I was suddenly intrigued by the little guy. He was telling me stuff about my dog that I wasn’t aware of. “How do you know that Benny doesn’t like your sister?” I asked. My world came to a complete standstill as I mentally weighed what the little boy had just told me. All these years later, I’m still wondering what was my dog thinking when he peed on that poor little girl’s cookie offering. Then I think of that little girl. I hope my dog’s actions didn’t scar her. …And I can’t stop myself from smiling every time I think about it.